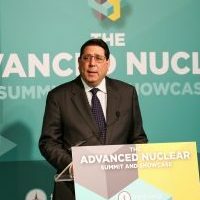 Kenneth N. Luongo is a recognized innovator, entrepreneur, and leader in global nuclear and transnational security policy. He is the founder and president of the Partnership for Global Security (PGS) and the creator of the Global Nexus Initiative. He served as the Senior Advisor to the Secretary of Energy for Nonproliferation Policy and simultaneously at the Department of Energy as the Director of the Office of Arms Control and Nonproliferation, Director of the Russia and Newly Independent States Nuclear Material Security Task Force and Director of the North Korea Task Force. He has authored nearly 100 articles, been a TEDx presenter, engaged extensively with global media, and briefed governments and audiences around the world on nuclear and transnational security challenges and responses. Mr. Luongo has created and led a number of cross-cutting international coalitions and private sector-policy expert partnerships that fuse diverse expertise to develop actionable, realistic responses to rapidly evolving security challenges. These include: the Global Nexus Initiative (GNI) a joint project with the Nuclear Energy Institute (NEI) to analyze the interrelationships among climate change, nuclear energy and global security; a partnership with the Biotechnology Innovation Organization (BIO) to address biosecurity dangers; the Nuclear Security Governance Experts Group (NSGEG), that made groundbreaking recommendations for improving international nuclear security; the Nuclear Policy Leadership Initiative, designed to strengthen U.S.-South Korea partnership; and the Fissile Materials Working Group (FMWG), a nuclear policy coalition. Mr. Luongo served from 1994-1997 as the Senior Advisor to the Secretary of Energy for Nonproliferation Policy and simultaneously as the Department of Energy’s Director of the Office of Arms Control and Nonproliferation, Director of the Department of Energy’s Russia and Newly Independent States Nuclear Material Security Task Force and Director of the North Korea Task Force. Mr. Luongo also was a Senior Visiting Fellow and Visiting Research Collaborator at Princeton University’s Program on Science and Global Security. Prior to these positions, he served as a professional staff member in the U.S. Congress with the House Armed Services Committee, Senator Carl Levin (D-MI), and Senator William Proxmire (D-WI). Mr. Luongo is a graduate of Boston University’s School of Public Communication (now College of Communication) with a degree in journalism and received a Master’s Degree in International Affairs from the American University School of International Service. Missing the Big Picture on Nuclear Security, PGS, April 12, 2018. Preventing a Nuclear Meltdown in the Middle East, The Hill, February 26, 2018. Strengthening Nuclear Governance, PGS, January 1, 2018. Nuclear Security 3.0, PGS, January 1, 2018. Nuclear Geopolitics: Facing New Realities, PGS, January 1, 2018. Nuclear Energy and Global Security in the 21st Century, PGS, January 1, 2018. Nuclear Power for the Next Generation: Addressing Energy, Climate, and Security Challenges, with the Global Nexus Initiative, May 2, 2017. Evolving Nuclear Governance for a New Era, with the Global Nexus Initiative, April 18, 2017. A Framework for Advanced Reactor Deployment, with the Global Nexus Initiative, November 3, 2016. Connecting the Dots to Fight Nuclear Terrorism and Climate Change, with Kenneth Brill, Huffington Post, March 29, 2016. The Role and Responsibility of Nuclear Energy after Paris, Bulletin of the Atomic Scientists, January 21, 2016. The Role and Responsibility of Nuclear Power in a Carbon Constrained World, with the Global Nexus Initiative, December 2015. Strengthening Nuclear Security Implementation Initiative: Evolution, Status, and Next Steps, with Bart Dal and Jonathan Herbach, NSGEG, October 27, 2015. Stopping a Nuclear Nightmare: How We Can Secure Loose Nuclear Materials, The National Interest, October 24, 2014. Integrating Nuclear Security Policy & Technology: Asian Centers of Excellence, with Sarah Williams, CSIS Policy Perspectives, July 17, 2014. Preventing Weak Links in Nuclear Security: A Strategy for Soft and Hard Governance, with Michelle Cann, NSGEG Policy Paper, March 20, 2014. Responsibility Beyond Rules: Leadership for a Secure Nuclear Future, NSGEG Policy Paper, March 18, 2013. Defining the End State of Improvement of Nuclear Security, NSGEG Conference Paper Series, November 14, 2012. Nuclear Terrorism: A Clear Danger, with Kenneth Brill, The New York Times, March 15, 2012.